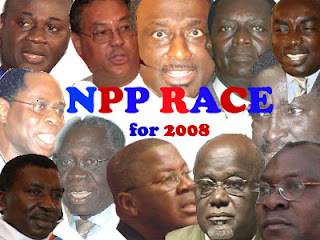 New Patriotic Party (NPP) presidential aspirants yesterday took time off from their electioneering campaign to attend a crisis meeting at the Osu Castle hosted by President John Agyekum Kufuor.The meeting, called at the instance of the party’s reconciliation committee, was to address certain nagging issues in the name of party unity.At the core of the complaints by most of the aspirants was the suspected presidential support for John Alan Kwadwo Kyerematen, a leading contender in the NPP presidential race.As at press time yesterday, the meeting was under way with all the aspirants in attendance except John Kwame Kodua, a Kumasi-based private legal practitioner, about who little has been heard in the race to elect a successor to President Kufuor.When Daily Guide caught up with him, Mr. Kodua said he was not aware of any meeting. According to him, he was just returning from a campaign trip to the Western Region and therefore the issue about a meeting was news to him. “You are now telling me. Nobody has told me about any meeting,” he said.Daily Guide learnt that a litany of issues was raised about the presidential race, including a strong accusation that the playing field was not level. The President was asked to stay out of the race. “Please stay out,” an aspirant was said to have fired. A similar meeting called by the committee last Wednesday was called off at the last minute, owing to what insiders described as “small lapses”.Some of the aspirants were said to have complained about the mode of the invitation, which was via an SMS text message, and the venue chosen. They contended that since it was a party matter, the meeting should be held outside the Castle, with some suggesting Australia House or the NPP headquarters. The reconciliation committee, comprising of elders of the party is chaired by the National Security Minister Francis Poku. Other members are Peter Mac Manu, National Chairman; Prof Daniel Adzei Bekoe and Madam Amma Busia, Chairman and Member of the Council of State respectively; Mr. Samuel Odoi-Sykes, former Chairman and immediate past High Commissioner to Canada; Nana Awuku of Sanaa Lodge, Tesano and Cape Coast and a retired Professor from the University of Ghana.The committee had met the aspirants one after the other at the Australia House, after which an account was reportedly submitted to the President leading to yesterday’s high profile meeting.The issue of the venue was finally resolved when the President made it clear that the meeting could not be held at any other place but the Castle.According to him, the aspirants could not be saying different things now, especially when they had been coming to him at the Castle location. The aspirants, DAILY GUIDE sources said, demanded a firm commitment from the President that he would not undermine their campaign in his bid to support a particular candidate.They had complained that the recent ministerial reshuffle carried out was skewed in favour of a particular aspirant. The issue of a directive to DCEs, asking them not to host certain aspirants, came up strongly. The meeting was still underway as at press time, with the President virtually ambushed.